iMacsoft DVD to BlackBerry Suite for Mac is powerful Mac DVD to BlackBerry Converter and Mac BlackBerry Video Converter suite specially designed for Mac OS X users who want to enjoy their DVD and video files on BlackBerry. iMacsoft DVD to BlackBerry Suite for Mac includes two powerful products: DVD to BlackBerry Converter for Mac and BlackBerry Video Converter for Mac. iMacsoft DVD to BlackBerry Converter for Mac, powerful Mac DVD to BlackBerry converter, can easily convert DVD to BlackBerry video formats AVI, 3GP, MP4, WMV and BlackBerry audio formats MP3, AAC, and WMA with the highest conversion speed and excellent video and audio quality. iMacsoft BlackBerry Video Converter for Mac can efficiently convert all popular video formats like MPEG, AVI, MOV, WMV, MP4, DivX, RM, RMVB, FLV, SWF, MKV, 3GP, ASF, VOB, etc. to BlackBerry video formats WMV, 3GP, AVI, MP4. iMacsoft BlackBerry Video Converter for Mac can also convert audio files like M4A, OGG, AAC, WAV, WMA, MP2, AC3, RA to BlackBerry audio formats MP3, AAC, WMA with highest conversion speed. iMacsoft DVD to BlackBerry Suite for Mac is an extremely easy to use Mac DVD to BlackBerry converter and Mac BlackBerry Video converter. Free download iMacsoft DVD to BlackBerry Suite for Mac and turn your BlackBerry to a moving theatre right now! Supporting multithreading and batch conversion, this Mac BlackBerry Video Converter and Mac DVD to BlackBerry Converter provide up to 300% conversion speed. iMacsoft DVD to BlackBerry Converter for Mac is powerful Mac DVD to BlackBerry converter which allows you to watch DVD movie on your BlackBerry. It can easily convert DVD to video format AVI, 3GP, MP4, WMV with fast speed. Even extract DVD audio and convert them to MP3, AAC, and WMA with excellent audio quality. 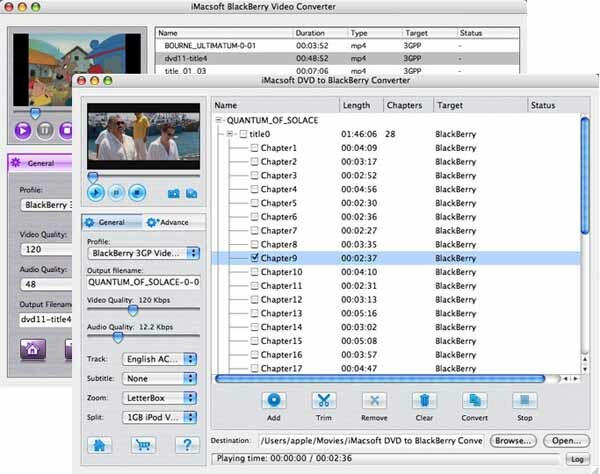 iMacsoft BlackBerry Video Converter for Mac can efficiently convert all popular video formats like MPEG, AVI, MOV, WMV, MP4,DivX, RM, RMVB, MKV, FLV, SWF, 3GP, ASF, VOB, etc. to BlackBerry video format WMV, 3GP, AVI, MP4. iMacsoft BlackBerry Video Converter for Mac can convert audio files M4A, OGG, AAC, WAV, WMA, MP2, AC3, RA to BlackBerry audio MP3, AAC, WMA with highest conversion speed and excellent quality.